Black Thursday received its name because it was on that day that the Stock Market began to crash. Investment in the Stock Market was quite small in 1929 compared with the present time but the conditions surrounding the market at that time were the reasons for its collapse. 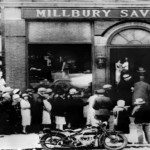 Thursday, October 24, 1929, is remembered as “Black Thursday,” the day that the New York stock exchange began to crash. Close to thirteen million shares were traded in the panic selling that took place on that day. It was not the biggest day of volume but the level of trading and the downward trend created fear and confusion, elements that are the greatest enemies of the market. The bigger day of selling came later, on Tuesday, October 29, when more than sixteen million shares were sold. It was the most devastating day in the history of the New York stock market. One story from later in the day, perhaps apocryphal, is that someone offered to buy a large number of shares for a dollar each and because there were no offers he got them all. Newspapers across the country told the story in their headlines, next day, October 30, in words like the following: stock prices virtually collapsed yesterday; billions of dollars of market value were wiped out; from every point of view it was the most disastrous day in Wall Street’s history. New York bankers, the people to whom investors looked for hope in the crisis, like all others, saw little prospect of recovery for the foreseeable future. Black Thursday had indeed been a turning point. Stocks began to lose their value rapidly, beginning on October 24. By the close of business on that day four billion dollars had been lost. It took exchange clerks until five o’clock next morning to complete the paper work. By the following Monday, the realization of what had happened began to sink in, and a full-blown panic was evident. Thousands of people, many of them ordinary working people, saw their recently acquired wealth disappear. In that last week of October the total value of stocks dropped by $15 billion. The crash heralded the end of a long period of economic growth, often referred to as the ”Roaring Twenties.“ There was a rapid increase in industrialization coupled with a rash of new technologies. The Ford “Model A” car came out in 1927. Radios were everywhere and sound movies were breaking all records about the same time. Most of all there was a spirit of optimism about the future. Wages were high and consumer spending was also high. The stock market caught the attention of more and more people as its values kept on climbing. One feature that caught the attention of more thoughtful people was the strength of a widespread desire to get rich quickly with a minimum of effort. It was a distorted understanding of the American dream that anyone can get to the top if he or she tries hard enough, and it became very evident in the Florida real estate boom of the mid-twenties. Large tracts of land in Florida were being subdivided into building lots and sold for a 10 percent down payment. The people who bought these lots had no intention of living on them. They had become convinced that Florida’s warm climate would attract an endless number of people from the cold northern states and this demand would continue to raise the value of the lots they had bought. Within a few weeks they could sell for a good profit what they had bought with borrowed money. As long as this continued and everyone profited from recurring sales there was no incentive to ask questions about how such a trend could continue indefinitely. The optimism of the time failed to see the risks in the speculative bubble with which they were involved. The first sobering reassessment came with the 1926 hurricane that killed hundreds and tore roofs off thousands of houses. Then, within two years of the first explosion of demand, the number of buyers from the north steadily decreased. By 1928 it was all over and defaults had multiplied. The boom and bust experience of Florida did not have a lasting influence on the get-rich-quick outlook. The new prospective bubble that appeared on the horizon was the stock market. The familiar Dow-Jones Industrial Index, often known as the Dow, had risen rapidly, from 100 in 1924 to 150 in 1926, then to 200 in 1928. These numbers might seem insignificant when we see more than 10,000 as the Dow’s value today, but the important thing to note about the 1920s was the rate of growth, doubling in four years. In fact, it accelerated rapidly after 1928, jumping from 200 to 350 within a year. That should have given some warning to investors but they failed to see the danger. Buying on margin became the popular activity in these years of rapid growth. It meant that you could buy stock at one tenth of its value using borrowed money. Borrowing money was no easier then than now but people thought that the high gains in the market would justify a high rate of borrowing. You then paid back over time what you borrowed, including interest, but as you did so the increased value of your stock more than paid for the cost of borrowing. It all looked so perfect that many thousands who never previously paid any attention to the stock market began to invest. They borrowed all they could, withdrew all their savings, even mortgaged their homes, and bought stock. A more useful measure of the times can be gained from the prices of individual stocks rather than the Dow. One mining company had a share value of $50 in 1924. By 1927 it had jumped to $274 and two years later to $575. If one could pick the right place in which to invest, people thought, enormous wealth could be secured. The Marconi Company’s shares jumped from $4 in 1927 to $28 a year later but one comment from the president of the company, warning everyone that shares were running too high, should have alerted investors to the volatility of the market. For that one remark the company’s shares dropped to $7 within two days. By the summer of 1929 interest in the stock market was at a fever pitch. The nation had never seen anything like it since the days of the nineteenth century gold rushes. Stock prices had jumped 78 percent since 1928. At lunchtime all traffic came to a standstill as thousands crowded into the New York Stock Exchange. New office blocks appeared almost every week to cope with demand. Anyone could buy stocks even if he had no money. Brokers were glad to loan money because they were sure that the rising value of stocks would more than cover their risk. Ships sailing for Europe were fitted with tickertape and brokerage offices so people could speculate in the course of the voyage. The enormous amount of unsecured consumer debt created by speculation left the stock market fragile. Some economic analysts warned of an impending correction, but their warnings were largely ignored. Banks, eager to increase their profits, speculated dangerously. Finally, in October 1929, the buying craze began to slow down. Many took note of the extremely high rate of growth and pulled back, but for most it was too late to change course. Before long the Federal Government decided it had to step in to establish control mechanisms such as the Securities Exchange Commission to make sure that fraud, overpriced stocks, and unrealistic levels of risk would never again ruin the stock market. At the same time the loss of so much wealth led to a massive downturn in the national economy and the first signs of the Great Depression surfaced. It lasted for ten years and the causes of this long period of economic stagnation are varied. Production of products had outrun demand. In the enthusiasm of the good times, manufacturing firms and investors had anticipated a certain high demand and designed production levels accordingly. It seems strange that the memories of the late 1920s did not last long. The intensity of the failures of that period should have alerted everyone to the unpredictability of the stock market, but in less than sixty years a similar collapse occurred. In 1987 there was a crash very much like that in 1929. Again it happened in October and it was a Monday, a “Black Monday,” that led the crash. In some ways, the 1987 crash was much worse than the 1929 one—508 points on the Dow, the biggest drop ever, compared with 124 points in 1929. In percentage terms the market lost 23 percent of its value in 1987 against 25 percent in 1929. The important differences, however, are the effects of the various controls instituted after 1929. There was no worldwide economic crisis in the wake of the 1987 crash, just a temporary slowdown before a rapid rise soon after, one that continued throughout the 1990s.